LSO St Lukes, the superb converted 18th-century church in Old Street just north of the Barbican, is the London Symphony Orchestra’s education centre and rehearsal space, but it is also an enchanting concert hall that for over ten years has been a venue for BBC Radio 3 Lunchtime Concerts. 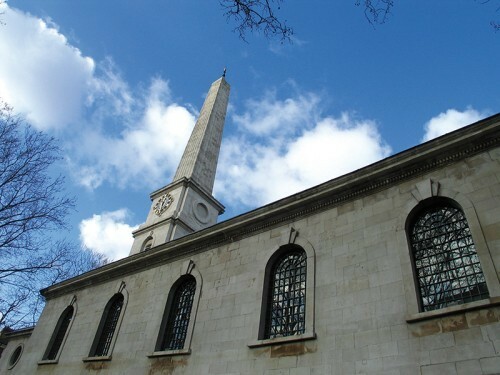 This year it presents its first ever early music series in the form of London Resounding, a four-concert mini-festival celebrating some of the great composers who lived and worked in London during the 17th and 18th centuries. They range chronologically from Gibbons, Lawes and Purcell at one end, through Handel and Pepusch, and on to JC Bach, Haydn and Clementi at the other, and the artists include LFBM familiars such as Florilegium and Musica ad Rhenum, as well as viol consort Fretwork and leading fortepianist Ronald Brautigam. The series has been planned by LFBM’s very own Artistic Director Lindsay Kemp, so we hope you’ll want to give it a try. Note: For full details of all concerts (and of a guided walk/lunch/concert package on 15 October) and to buy tickets (£12) call the Barbican Box Office on 020 7638 8891 or visit the LSO website. This entry was posted in Arts / LifeStyle / Travel and tagged concerts, London, lunchtime. Bookmark the permalink.